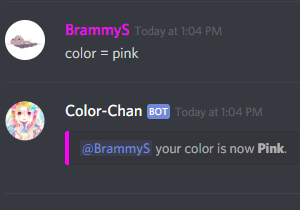 Color-Chan is a fast growing simple to use color name bot with 16,777,216 different color possibilities! The bot is highly customizable to fit every server type/size. You can use color add to add colors to your list. Click here or here for more info on the color codes. 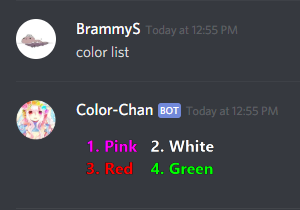 Use color list to see all the colors that are in your server. Use color = colorName to change your color! Note: you can also use the color number. color help Basic List of all commands. color setup Basic Shows step by step how to set me up. color list Basic Lists you all the available colors. 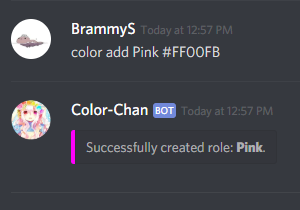 color = 'colorName' Basic Adds a color to your account. color on join Basic Automatically gives a color role to the people that join your server. color remove Basic Removes your current color. color delete 'colorName' Basic Deletes a color role. color = random Advance Adds a random color from the list to your account. color reAdd colorName Advance Re-add a color if it disappeared from the list. color add random Advance Creates a random color role. color info `colorName` Advance Shows info about a color. color clear list Advance This command deletes all color roles. This can not be reverted! color export Advance Returns the export id of this server. color import Advance Imports the color list from a server. color update list Advance Regenerates the color list. color prefix Settings Creates a custom prefix for your server. color remove prefix Settings Removes the current custom prefix. color channel Settings Sets the channel where you want to use the bot. color remove channel Settings Removes the current channel so you can use the bot everywhere. color spelling Settings Changes the spelling of color to colour for all the commands. color management role Settings Set a role that is allowed to use color add/delete commands. color remove management role Settings Remove a management role. color management roles Settings Shows the current list of color management roles. color donate Misc Sends a link where you can send donations. color invite Misc Get a invite link. color vote Misc Get a vote link.